The success of the Wisconsin Idea doesn’t happen alone. It takes strong partnerships between the University of Wisconsin–Madison and many others. In recognition of this teamwork, the university will honor seven collaborations with the 2017 Community-University Partnership Awards, held from 5 to 7 p.m. June 28 at Olin House. 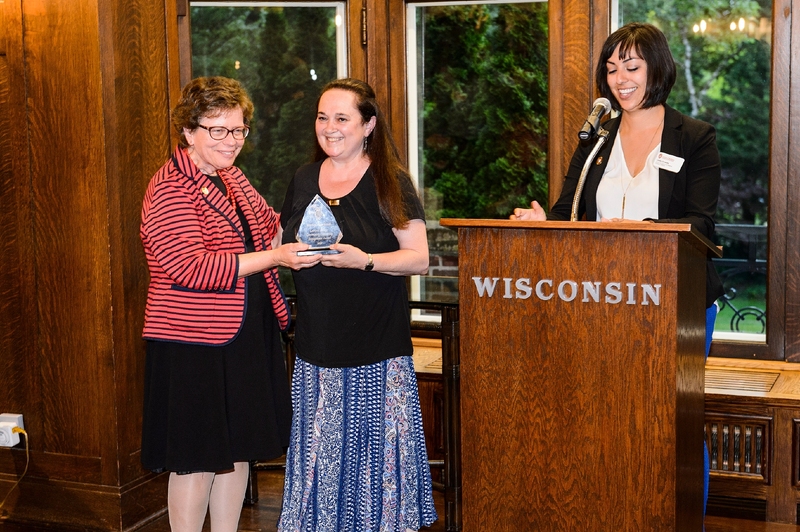 The awards highlight exemplary partnerships that get to the heart of the Wisconsin Idea: community members and UW–Madison personnel working collaboratively to transform the campus and community for the public good. They’re a way to thank community partners and recognize the work of UW–Madison faculty, staff and students as they join together to address pressing public issues in Madison and the surrounding region. They are sponsored by UW–Madison’s Office of Community Relations, Community Partnerships and Outreach (CPO) Staff Network, with support from the Office of the Chancellor and the Morgridge Center for Public Service. Literacy Network is the only agency in Dane County offering citizenship classes to help lawful permanent residents learn US civics and history, and pass the U.S. citizenship test. But demand for citizenship classes increased 76 percent over three years, exceeding their capacity. Madison Path to Citizenship and Literacy Network, previously collaborating through a larger coalition, entered a new level of partnership by applying together for a City of Madison grant to expand naturalization classes and teacher training. This has enabled Literacy Network to become the node for citizenship training, teaching tutors for other Madison Path to Citizenship partners. The partnership has also brought the first outside funding for Literacy Network’s citizenship classes. By scaling-up the training of teachers, Madison Path to Citizenship and its partners can better meet the growing needs of the estimated 12-15,000 lawful permanent residents in Dane County who are eligible to apply for U.S. citizenship. This partnership confronts the racialized barriers facing local hip-hop artists. The partnership adds research capacity to the Urban Community Arts Network (UCAN), which supports local hip-hop artists and challenges public perceptions of hip-hop in Madison that limit access for artists. Their work this past year started with a data set of calls for service to the Madison Police Department for the Madison bars with entertainment licenses. Data was then added on whether there was a performance during the period of a call and what the genre of the performance was. Data could not conclude that Hip-Hop’s association with greater violence was warranted. Planning is underway for the next stage of the partnership. Partners: Dr. Ellen Wald, chair, department of pediatrics; Dr. Jessica Scott-Schwoerer, faculty; Dr. Mei Baker, faculty; Dr. Jennifer Laffin, faculty; Ashley Kuhl, staff; Dr. Gregory Rice, faculty; all in the department of pediatrics. Dr. James DeLine completed his medical training in family medicine at the University of Wisconsin–Madison and then began his career in a rural part of Wisconsin, LaFarge, where he has been serving the needs of these communities, including the Amish. Wisconsin has the fourth largest Amish and Old Order Mennonite, or Plain, population in the U.S. with the largest settlements around LaFarge. Rising health care costs, lack of health care benefits, inaccessibility, and cultural beliefs result in people of the Plain communities avoiding or deferring health care. Dr. DeLine’s practice has been addressing these disparities for more than 30 years. In 2012, Dr. DeLine and UW–Madison faculty began a collaboration with a shared goal to improve access to culturally sensitive, high quality, and affordable care for Plain families. In 2016, Dr. DeLine founded the Center for Special Children as a dedicated space within the LaFarge Medical Clinic intended for the care of children with genetic conditions and represents the culmination of the vision for the partnership. The collaboration continues to impact the academic mission of the University of Wisconsin. Not only has it improved the health of Plain children in Wisconsin, it has translated to biomedical research projects for UW faculty, informed approaches to medical care for all children, and improved the educational experience of students on our campus. Partners: Steven Swanson, dean of the School of Pharmacy; Professor Jeanette Roberts; Mara Keiser, Assistant Dean for Experiential Education, School of Pharmacy. Partner Organization: Society of St Vincent de Paul District Council of Madison, Inc. In 2012, a Pharmacy Startup Advisory Committee was constituted with members from the UW School of Pharmacy, the Madison SVdP and local pharmacists to design, build and launch the first charitable pharmacy in the state of Wisconsin. A section of the basement at the Madison SVdP headquarters was remodeled into a pharmacy, a managing pharmacist was hired and student and community volunteers were recruited. The pharmacy fills prescriptions and provides related services at no charge for low-income uninsured adults who are among those in greatest need in our community. The pharmacy stocks many medications to treat common conditions such as heart disease, diabetes, infections and other chronic or acute illnesses and dispenses drugs valued at hundreds of thousands of dollars annually. All services are provided in a compassionate and respectful way. The school remains involved with members on the Charitable Pharmacy Advisory Committee and through faculty, student, and alumni volunteers at the pharmacy. The Community Academic Research Network (CAARN) is a partnership involving the University of Wisconsin, the Wisconsin Institute for Healthy Aging (WIHA), the Greater Wisconsin Agency for Aging Resources (GWAAR), and Wisconsin’s Aging Network. CAARN’s mission is to facilitate research partnerships to improve the health of Wisconsin’s older adults. Two community research associates (CRAs) employed by community partners facilitate Community-University partnerships. The CRAs identify and bring together Aging Network stakeholders and University faculty who are interested in research to improve older adults’ health. The CRAs help the partners design interventions and obtain funding to test these interventions. CRAs educate partners about community-based participatory research, assess partners’ readiness to engage in research, and facilitate collaboration across all phases of research from pilot study to randomized trial to dissemination of interventions once proven. To date, CAARN has facilitated 46 studies involving 53 Wisconsin counties and one tribe, and 30 faculty from across UW–Madison. In 2011, the University of Wisconsin Carbone Cancer Center and Adams County, Wisconsin, community members partnered to develop a community-based initiative, the Adams County Cancer Awareness Team (ACCAT). The goal of this partnership was to culturally adapt and pilot a cancer education resource, with the long-term goal of reducing cancer disparities in Adams County. Through this work, UW and ACCAT built a strong, long-lasting, community-driven cancer prevention initiative, in which they developed, culturally adapted, and pilot-tested Cancer Clear & Simple (CC&S), a cancer education program. CC&S is now a resource for conducting cancer education across Wisconsin and is the focus of community-partnered research, funded by the American Cancer Society, to test the effectiveness of CC&S in enhancing cancer prevention literacy and cancer prevention behaviors in Adams County. This remarkably successful partnership truly embodies the Wisconsin Idea that the university serve the people and Wisconsin communities. The Milwaukee Consortium for Hmong Health was founded in 2008 to increase capacity in the Milwaukee community to address cancer health disparities for Hmong women. Over the past decade, the Consortium’s “Healthy Hmong Women” project has worked to achieve this goal by developing and implementing a community-based, culturally-appropriate community health worker (CHW) program aimed at improving Milwaukee Hmong women’s cancer knowledge and screening. This program, which was recently expanded to serve other Southeast Asian immigrant communities in the Milwaukee area, trains local women to serve as lay health educators and peer navigators, and provide communication, education and outreach on cervical and breast cancer issues. Since its inception, the Consortium has trained 10+ bilingual/bicultural CHWs, engaged more than 500 Hmong, Burmese, Karen & Karenni women in lay cancer health education, and successfully increased screening rates for Southeast Asian women in the community. Additionally, Emily Auerbach will be given the 2017 LaMarr Billups Community-University Engagement Award. 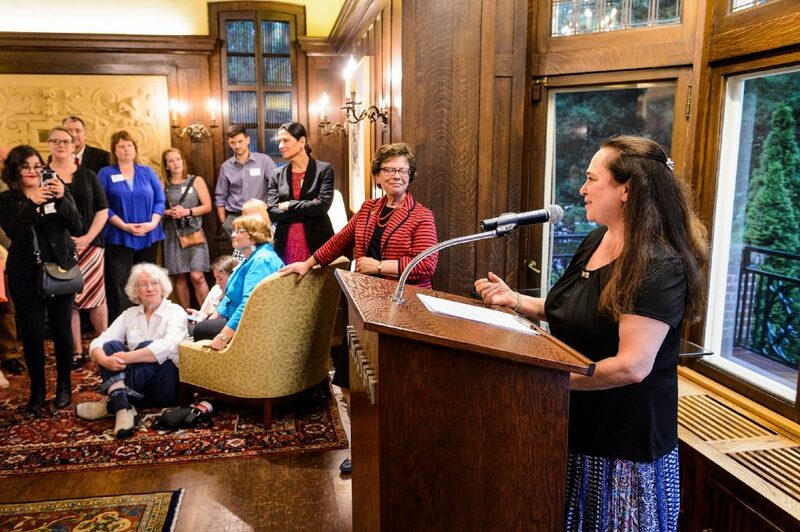 Auerbach, professor of English at UW–Madison, was recognized for her long-term commitments to responsive programming such as Odyssey Project, University of the Air, Tuesday Morning Book Talks, and Eloquence and Eminence. The LaMarr Billups award is a prestigious one for individuals who have demonstrated outstanding contributions to campus-community partnerships. LaMarr Billups was a highly-respected community leader at UW, and was deeply committed to key civic institutions and social causes. He served as a special assistant to two UW–Madison chancellors and was the director of community relations from 1996 to 2007.